Ideal as hearty party food on a chilly night, this is also good for lunch. 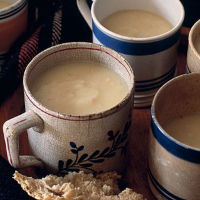 It can be made up to two days ahead and gently reheated – serve it with crusty bread. In a large, heavy-based pan, heat the olive oil and stir in the onions and garlic. Cover and cook gently for about 8 minutes, until softened. Add the parsnips and potatoes and stir, then add the butter beans with their liquid, the stock, bay leaves and lemon juice. Bring to the boil, then reduce the heat and simmer for about 20 minutes, until the vegetables are tender. Remove the bay leaves, add the crème fraîche, then purée with a blender. Thin with the milk. Season and reheat before serving. Try a glass of chilled white port.